Okay, I guess I've kept you all waiting long enough! It’s been staggering the amount of you who read, acknowledged and praised part one, to those people- a massive thank you! I believe we left off wondering about the items deposited on my table at the start of the experience (calling it a meal seems an injustice, bearing in mind the technical wizardry, visual presentation and finesse on display). So, I travelled four thousand miles, to (what I admit we didn't know was) a three Michelin-starred restaurant, and had to roll a 'fajita' myself, at the table, and eat with my fingers! Seriously, this was another sensational dish, made just about as close to perfection as you will find, by myself. The flavourings provided for assembling the dish were-smoked sea salt, fresh blackberries, charred onion, black garlic, sweet potato, Nicoise olives, sour cherry, diced tomato in vinaigrette, diced salsify and a tobacco jelly. Once encased, in the by-now perfectly room temperature paste, the hot rib and other flavours balanced temperature, taste and texture amazingly. The interaction of having to make it yourself is part of the humorous element which takes chef Achatz's food to a new dimension. Next up: a classic Achatz signature dish-'hot potato, cold potato, black truffle, butter'. Let’s say now, it’s a classic for a reason- it’s another assault on multiple senses at once. Each service, the chef responsible for the dish makes hundreds of little wax bowls approximately three inches in diameter. For serving, he has to pierce the side of the bowls with a steel pin, on which is placed a tiny chunk of Parmesan, a tiny cube of butter, a chive baton, and finally a hot ball of potato topped with a slice of black truffle. The wax bowl is filled with chilled potato soup and brought to the table. 'This is the only time sensitive dish, so be quick' says a waiter as I hurriedly try and take my photo. I ignore him briefly, but the scent of truffle soon made me agree with him and I took the pin out, dropping the chunks, ball and baton into the chilled soup and then threw it back 'like an oyster', as I was told to do. Truffle aroma, buttery potato richness and the alliums flavouring of the chive, as well as the temperature differences combine to please several taste buds and senses at once, and the slightly unusual act of eating without cutlery making me feel childlike, as though I was doing something wrong, but how can it be wrong when it tastes this good? 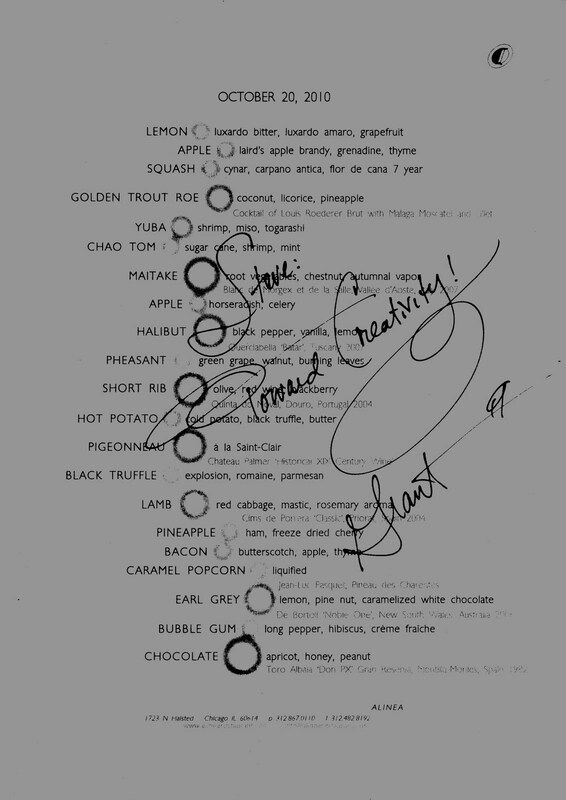 In the Alinea book, Achatz asks the question whether keeping some dishes on the menu is stifling creativity or honouring it. I for one, am extremely glad he feels confident in the creativity of himself and his team that he can keep a few signatures around to put on the menu as he feels the need - if you buy a ticket to go and see a gig, you expect to hear the hits, as well as the new stuff. To follow on from a modern day Alinea-Achatz classic, we travelled back to the nineteenth century to sample an Escoffier classic. For anyone who doesn't know, Escoffier was a French chef accredited with formalising the recipe book, and assembling one of the most comprehensive repertoires of any chef then or since. As an hommage to Escoffier, I was served one of Escoffier's creations- 'pigeonneau a la saint-Clair'. This was visually different from the rest of my experience that night, as it resembled the kind of dish we used to put out when I was receiving my formal training as a young chef in the old school, classical restaurants I started in. That's not to say it was old hat or done with any less precision or technique than everything else I ate- far from it, it was just an unusual brief departure. An early glimpse perhaps of what chef Achatz is hoping to recreate with Next- his soon to open time period themed restaurant in Chicago. As though my night up to then had been wasted, the next course was one of two highlights (the other is being reserved for a final Alinea post). And it’s another signature dish from chef Achatz - 'black truffle explosion': a dish of dazzling simplicity- or so it looks, but with its simplistic look comes what must be a harrowingly difficult task for the chef on this dish each night. A black truffle stock is jellied, then enrobed in a smooth silky pasta sheet, which literally explodes in your mouth releasing the most pungent, sweet and earthy aroma and taste of truffle. In his book, Achatz reveals the torture of the young chefs starting to make it for the first time-the pasta has to be knead for fifteen minutes or it will tear, and the kitchen mustn't be too humid or the jellied stock melts and makes the pasta break- so getting this dish right time and time again is impressive to say the least. What is more impressive is the way that after the 'explosion' in your mouth, you feel as though you will have that taste with you for the next week, but it slowly dissipates and you are left clean-mouthed and truffle free. I could write superlatives all day about this dish, it comes presented on what the waiter said is known as the anti-spoon, a spoon rested on a circular piece of china, in such a way that it just floats above the table. there is a tiny piece of very mature Parmesan and some crisp romaine lettuce on top, there is no smell of truffle until you have the entire thing in your mouth - 'eat it in one, and don't open your mouth while you eat it, it really does explode!' were my words of advice on this occasion, and I'm glad I heeded the advice. As you pop the spoon in your mouth, close and bite, there is a real sensation that there was more liquid inside the pasta than seems possible- the 'Tardis' effect again! As I waved farewell to the friend I had experienced fifteen courses with up to then, I received three courses at once again. To keep from confusing myself and you, I will call them by single ingredient names- pineapple was one, bacon was two and three was popcorn. Of course they all go together and of course they all taste amazing, but who knew how good they could be? The pineapple transparency was a crisp sheet of incredibly tasty pineapple which was sprinkled with powdered Virginian ham. The bacon was apple-wood smoked bacon, dipped in syrup and hung to dry on another bespoke piece of table wear which resembled a bow/washing line: The bacon hanging on the thinnest of wires like a crisp bed sheet. The popcorn, my word the popcorn, came in liquefied form, in a glass tumbler, with a light foam texture and the most brilliant impression of a bag of buttered toffee popcorn I have ever drunk! I had them in the order I just described, and they were perfect, logical steps to bridge the gap between savoury courses and sweet. Sat Bains calls it the 'crossover' on his menu, like an introduction of the two, where you take a few strides with a foot in each camp before launching into the homeward steps of the desserts. This course took two waiters to bring to me, one for the plate, and one for the warm pillow filled with earl grey scented air, which was slowly forced from the tiny holes in it, again creating a multi-sensual experience, as the weight of the plate pushed down: An incredible extra dimension to the whole dish, which would have been great without it. With the pillow, well, I'm all out of adjectives. I have to repeat- fun, tasty, sublime, brilliant, and incredible. At this stage I was told I had two courses to go, and immediately was filled with the sad realization that I wasn't going to be at my table forever, constantly being fed morsels of increasing brilliance, and that in fact, this perfect opera was nearing its closing bars. As if sensing my sadness, the waiter brought me the most fun dish of the night- 'bubblegum, hibiscus, long pepper, crème fraiche. If I told you that this dish was jellied hibiscus and long-pepper jelly would you think it was fun? Maybe. What about if I mentioned that the crème fraiche was flavoured with vanilla and lemon? Fun? Probably not. Okay, how about the news that the bubblegum was a flavoured stock which tapioca was cooked in? Is that your idea of fun? Probably more fun than the rest, but let’s add all the fun and tell you that these ingredients came in the order I just described, but I had to slurp them out of a long glass pipe, like a test tube with no bottom, making a loud slurping noise as I did so? There's your fun element right there. The bizarre thing is, I hadn't seen anyone else have it that night, but I know they did because they were all given the same menu as me at the end of our respective meals. I guess I was so engrossed in other courses, I missed it all. It seemed so loud to me as I sucked on the pipe- 'like a cigar is best' said the cheerful redhead- that I was sure I would have recalled! It was great tasting, as well as fun, with the flavours of bubblegum being hibiscus, pepper and vanilla, they all revealed themselves in turn, with the tapioca giving a chewy, gum texture which made me think of the 'hubba bubba' years of my childhood. Amazing. That, my friends, is where I must leave you hanging again. There was one more course, and what a course and what a presentation, but that needs a bit of technical jiggery-pokery on my part, to edit and upload a video. Yeah I know who reviews a restaurant by video. Well, I did, and trust me, it’s worth the wait! Growing increasingly jealous of your meal mate... excellent writing. looking forward to the next one!